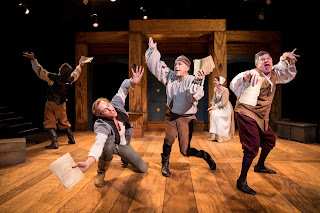 The subtitle of Bill Cain's play Equivocation could be, It's Hard to Be the Bard. It's hard to be the bard at a time when one of England's longest reigning monarchs to date, who has kept the country relatively stable and supported your artistic career, is gone, and you're dealing with a tumultuous and changing political and religious landscape, with a choice to either support the new ruler and his lies or tell the truth. Can you imagine such a situation?! 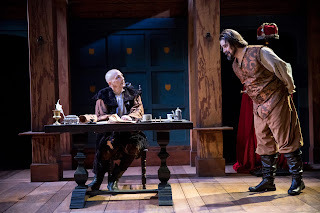 This is the fictionalized version of true events proposed in the play, in which playwright William Shakespeare (or Shagspeare) is commissioned by the newly crowned King James I to write a play of the recent failed plot to kill the king and members of Parliament, known as the Gunpowder Plot. The play mixes history, religion, theater, and politics in an immensely clever, if a bit too long and involved, way. 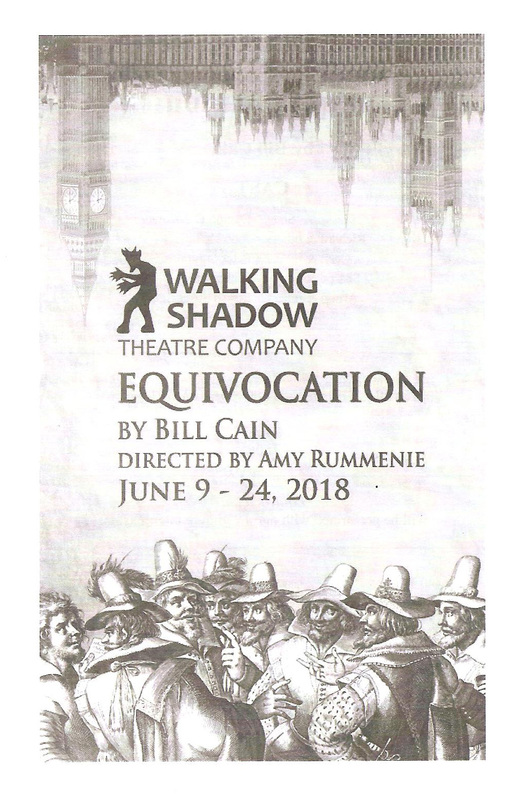 Walking Shadow Theatre Company's staging of Equivocation, playing at Gremlin Theatre through June 24, is engaging and entertaining (or at least as engaged and entertained as this morning person can be at 10:30 pm). The play includes several historical figures, nicely described in the program along with other helpful dramaturgical information. Robert Cecil is listed as Secretary of State, but he's portrayed as King James' right hand man, who bestows the commission upon our playwright Shags. The problem is, the King's version of the plot may not be entirely true, and since it ends with an explosion that doesn't happen, is lacking in dramatic urgency. Shags and his company of actors try to figure out a better ending, and Shags asks to talk to some of the plotters before their tried (and ultimately hanged, drawn, and quartered, ew). As he talks to these doomed men he begins to doubt what he's doing in writing this play. On a personal level, he's grieving the death of his son, which keeps him at a distance from his daughter Judith (the only female character in the play, but at least she's a smart, strong woman with a mind of her own). A whole lot of plot unfolds over the course of 3+ hours, and the action flows between interactions between the characters and acting out scenes of the new play and Macbeth, which they decide to do instead. The versatile cast, most of whom play multiple characters, sometimes in the same scene, do a remarkable job keeping up with all the time, place, and reality shifts, under Amy Rummenie's clear direction. Damon C. Mentzer, a newcomer to the #TCTheater scene, is a great leading man as our troubled hero Shags. Playing multiple characters with ease are Peter Simmons, Edwin Strout, John Heimbuch (who stepped into the role, or roles, just a few days before opening, which you'd never know except for a few glances at the script, which will certainly lessen throughout the run), and Mitch Ross (making his impressive professional debut and bearing not a little resemblance to Paul Bettany). Last but not least, Eva Gemlo more than holds her own with the boys as Shags' daughter. The play is well staged in Gremlin's intimate thrust space, against a backdrop of wooden columns and archways that allow for the illusion of hanging, with plenty of space for some fun and exciting fight scenes (choreographed by Annie Enneking, natch). The early 17th century ambiance is created by Steve Kath's solid and rustic set, A. Emily Heaney's period costumes that easily transform from one character to another, and Thomas Speltz's original compositions and sound design. This play gave me a lot to chew on, and plenty to look up on Wikipedia for further exploration (I swear I'll soon be an expert on the history of the English monarchy just from seeing plays). Historical tidbits, moral dilemmas, family drama, religious feuds, this play has it all! While I wish the playwright had been a bit more succinct about it, it is fascinating piece, well executed by the cast and creative team at Walking Shadow. Equivocation continues at Gremlin Theatre through June 24. Have you seen a great show recently that you think I should see? I'd love to hear about it, email me at cherryandspoon@gmail.com. I receive complementary tickets to shows that I see in exchange for writing about them. The sculpture "Spoonbridge and Cherry" was created by Claes Oldenburg and Coosje van Bruggen in 1988 for the Minneapolis Sculpture Garden at the Walker Art Center, original site of the Guthrie Theater. I chose "Cherry and Spoon" as the name of this blog because it seems a fitting and recognizable symbol of the Minnesota cultural scene. Copyright © 2010 Jill Schafer. All rights reserved. Simple theme. Powered by Blogger.